Sliced watermelon is one of the easiest and tastiest snacks — other than fruits or veggies eaten out of hand. Alas, watermelons are too large and have peels that are too thick to munch into, so we must somehow cut them up to eat first. The following steps show how to do this easily and safely — those round edges can make cutting trickier than other foods! Here we have a mini-watermelon, chosen to make the picture-taking easier (it's small size and vibrant color make it easy to capture these steps), but the method is the same no matter which type or size of melon you want to cut into easy-to-hold slices, from cantaloupe to honeydew. On a cutting board or other firm work surface, hold the watermelon steady with one hand. Use a heavy, sharp knife to cut off each end of the watermelon, cutting off enough peel to expose the watermelon's pretty flesh underneath. Cutting these flat ends make subsequent cuts much safer and easier. It is safer because it creates flat sides, so the watermelon will stay still as you cut it. 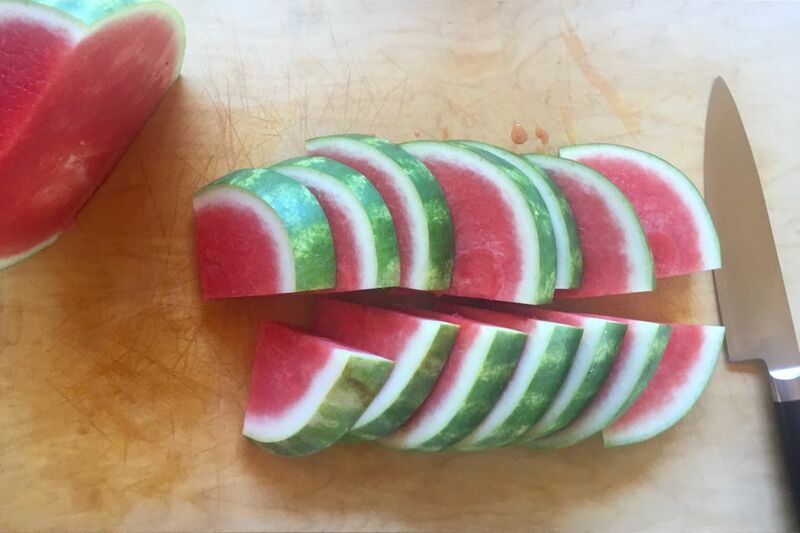 Easier because it exposes where the watermelon rind ends and the fruit starts so you can judge how big to cut the slices. Using a sharp knife makes cutting easier (duh!) but also safer: since you won't need to move the knife to make it cut, you're less likely to slip and cut yourself! It may be counterintuitive, but it's true: sharp knives are safe knives. If you have a heavy knife, that will make these big initial cuts easier since its weight will help cut through the heavy watermelon. Stand the watermelon on one of the cut ends — it should stand steady. Use that same sharp (preferably heavy) knife to cut the watermelon in half lengthwise. Lay each half of the watermelon on its broad cut side. For larger watermelons, you may wish to cut each half in half lengthwise, or even quarters, to end up with more manageable melon slices. Cut the halved melon into thick or thin slices, as you wish. Serve the watermelon slices immediately or keep them, covered and chilled, until ready to eat. They will keep nicely overnight if you want to prep them the night before. 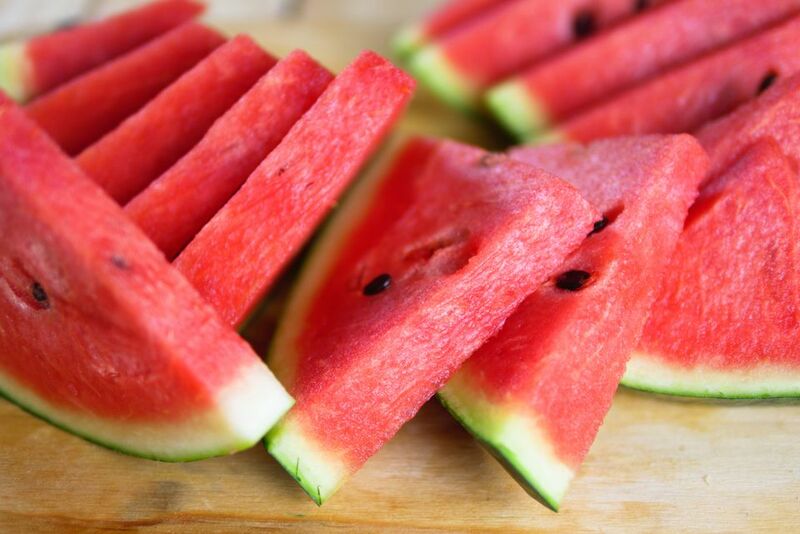 Giving them a bit of time in the fridge gives them even more of the refreshing chill we all crave during those hot days of summer when watermelons are at their best. Want to keep the cold and refreshing? Set the slices, peel-side down, on a bowl of ice. Spritz with lime juice and sprinkle with chili powder. Salt & pepper — no joke, it's delicious on a sweet melon. Serve alongside a cheese or charcuterie platter—sweet melon balances out salty cheese and meat very nicely. Sweeten up less-than-perfectly ripe melon with a drizzle of honey or agave syrup. Offer melon slices sprinkled with salt alongside tequila shots in place of the more pedestrian lime wedges for fun — and more satisfying — take on throwing one back. Plop a slice of melon alongside a dish of sorbet.